For the second consecutive week, Boston College sits atop the fresh national rankings, released Monday afternoon. The Eagles remained in that perch -- and gained all but one first-place vote -- thanks to becoming the first program in Division I to clinch a regular-season conference title thanks to a pair of wins against Vermont at Gutterson Field House. "Trophy Season" is in full swing in Chestnut Hill, and Jerry York's kids extended their national-best unbeaten streak to 17 games (16-0-1) with 4-3 and 5-3 decisions following their fifth consecutive Beanpot title last Monday in a 4-1 win against plucky Northeastern. Johnny Gaudreau scored two goals and added one assist over the weekend to extend his scoring string to 26 games, leading the nation in all categories with 27 goals, 34 assists and 61 points over 31 contests. BC finishes up its schedule with a pair of games against UMass-Lowell and one with inter-sport rival Notre Dame. Minnesota remained hot on the trail, clocking in once again at #2 thanks to a pair of home victories over Michigan by 5-3 and 4-1 scores. The Gophers improved to 13-2-3 since Thanksgiving, and will have a well-deserved bye week this weekend before welcoming Penn State to the Twin Cities. Union stayed put at #3 after extending its unbeaten run to five games (4-0-1) after topping Cornell 4-1 in Ithaca and then tying Colgate, 4-4, in Hamilton. Flyers defensive prospect Shayne Gostisbehere came away with two assists and a plus-2 in the weekend set. Rising two spots to No. 4 is St. Cloud State, who ran its unbeaten streak to four games by taking down Minnesota-Duluth on home ice by 5-3 and 4-3 counts. Quinnipiac and Ferris State, last week's tie for fourth spot, both slid into fifth and sixth places, respectively. The Bobcats blanked Yale on the road (4-0) and lost at Brown, while the Bulldogs split at Bemidji State, winning 4-1 and losing 2-1. Lowell remained firm at #7 with only one game on its slate, a 3-2 decision at UMass, extending its unbeaten run to 5-0-1, while Wisconsin stayed put thanks to splitting at Ohio State. Beneficiaries of the largest jump in the rankings among the top 10 programs, the Huskies rebounded from losing the Beanpot by sliding past UMass to find themselves in ninth place. In a head-scratcher, Michigan retained its place at #10 despite having lost three consecutive games, including two at Minnesota. 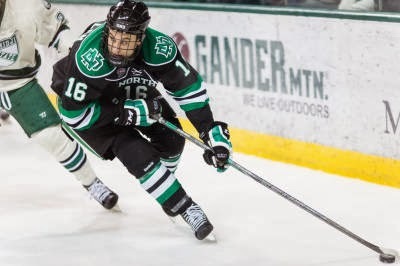 North Dakota is making a late-season push towards respectability by jumping six spots from #17 to #11 on the strength of taking down Miami of Ohio at Engelstad Arena with 3-2 and 9-2 triumphs. The Fighting Sioux improved to 7-2-1 since the turn of the new year, with Flyers forward prospect Michael Parks contributing a goal and one assist in Friday's win and then two helpers in Saturday's rout. Penn State was unable to create some momentum on home ice, in their third and fourth straight games at Pegula Arena this past weekend. Michigan State followed up where it left off in East Lansing a month ago, taking the series. The Spartans tied 2-2 on Friday and won 2-1 on Saturday. Matt Skoff made 32 saves and Dylan Richard gave the hosts a one-goal edge on a power play near the midway point of regulation in the series opener, but Michael Ferrantino pulled the visitors even with 3:54 left in regulation and MSU "won" the shootout. The closer saw Patrick Koudys open the scoring just 43 seconds after the drop of the puck, yet Skoff allowed Joe Cox and Matt Berry to measure him -- the final tally coming 5:04 before the buzzer -- to give the Spartans a narrow victory. Penn State, now 1-10-1 in its last 12 games, heads out on the road once more for two at Michigan this coming weekend and then two more against Minnesota at Mariucci next weekend. Princeton endured a mixed weekend on the road against a pair of Ivy League opponents, but managed to put an end to its losing skid in the process and brought a senior into the limelight. Friday night in Providence, a five-game losing streak was put to rest with a 3-2 triumph against Brown. Andrew Ammon assisted on all three tallies, including the deciding marker from Ryan Siiro just after the midway point of regulation. Hayden Anderson and Ben Foster added earlier goals to back 36 saves from Colton Phinney. The second game in the back-to-back was a 7-5 loss in New Haven against the defending national champions, but Ammon broke through with a career-high five points on two goals and three helpers. Sean Bonar surrendered six goals on 38 shots, but Yale backup Alex Lyon wasn't much better by allowing five scores on 35 shots. Ammon scored twice in a row to pull the Tigers within 3-2 in the second period, then assisted on goals 71 seconds apart in the third as they went from 6-3 to 6-5 down late in the final stanza. Andrew Calof contributed a goal and two assists in a game that wasn't locked up until Kenny Agostino scored a short-handed, empty-net goal with 1:31 to play. Princeton returns to Baker Rink this weekend with a New York doubleheader, as Colgate and Cornell on Friday and Saturday.